During my almost 20 years of corporate desk jockeying, my typical work days were just that, days. So, if you said "night shift" to me, I might free associate with the late 80's comedy by that name starring Henry Winkler (you know, Fonzie) and Michael Keaton where they worked at a morgue and turned the place into a dating hot spot (if I remember correctly). Or, maybe, the Stephen King compilation of short stories, also from the 80's. Here at TK, where I have been working the day shift, it has meant some of the other guys in my platoon who, like elves, came late in the night to work under the cover of darkness when no one else was around. Well, pass me the Keebler cookies, because yours truly is about to join the night shift. As a highly evolved diurnal mammal, there are certainly cons to working on the night shift - such as trying to sleep during the day while your roommate is just waking up and maybe not always being the quietest mouse in the house. Or, after you wake up, the first meal served at the mess hall (pardon me, dining facility) being everyone else’s dinner. However, I think there are pros which will, I hope, outweigh the cons. Like not having to work my entire shift out in the sun where the temperatures have been holding fairly steady at 100+ and are going no where but up as we move into the summer months. And since I have been getting up so early to begin my day shift, there wasn't really time for physical exercise before work and it was very challenging for me to find the motivation to go to the gym after spending the day being slow roasted. Now I will be able to start my day by working out after waking up; a much more preferable routine for me personally - get the juices flowing. Also, let's face it, quite often, there is not as much customer interface in the wee hours - making the night shift a bit more of a relaxed environment than the day shift. So, all in all, don't tell anyone or they may move me back to days, but I think I am going to enjoy the shift to night. In June of 1983, I was huddled together with the rest of my Basic Training platoon in Fort Leonard Wood, Missouri, as our Senior Drill Sergeant regaled us with the three things the Army would hold sacrosanct for soldiers. We trainees were hoping one of the three would be sleep, but based on the average of four hours (not even consecutive) we had received that first week of Basic, it didn’t seem likely. As the Senior Drill’s crazy-eyes pierced each of us from under his una-brow, he declared, with enumerating fingers slapping into the palm of his hand: one - mail; two - meals; and three - money. During the rest of Basic Training, his words proved true as all efforts were made to ensure we had a daily mail call; even if we had to do push-ups for every letter received or eat all the cookies/candy/etc. in one sickening binge in front of the platoon once the package was opened and the "contraband" was discovered - much to the hooting joy of the anticipating audience and the lurching dread of the recipient. During the following years, I had three over-seas tours and much more appreciated the cookies and mail I received from family and friends, but not nearly as much as I do now here in TK. Part of the pleasure probably comes from anticipation since, due to logistical arrangements, mail arrives to the base and is distributed just three days a week: Tuesday, Thursday, and Sunday. Typically, the mail is sorted in the mornings so it is generally the afternoon when it finally makes it way into the hot, greedy hands of the waiting soldiers. So, when you do not receive anything on Thursday, it seems like a long wait through Friday, Saturday, and most of Sunday before finding out if there will be something for you. But when there is mail, there is warm pleasure in knowing someone out there is thinking about you and has gone through the time and trouble to post something. Sure, getting an email is nice, as well, but it really does not compare to the tangible, hands-on experience of getting a package or letter. An email is a bit ephemeral and is only accessible electronically while a letter can be carried in a pocket and read any time; a photo taped up, can be the last thing seen before going to bed and the first thing upon awakening. The letter or package does not even have to be from someone you know to bring delight and raise morale. There are quite a few groups which spend a lot of time and money (mostly donated) sending letters and care packages to soldiers/service members. If you Google “soldier care package”, several of these organizations will be at the top of your list; at their respective sites you will find details on how you may support them with time, money, donations, or ways to send items directly to soldiers. “Directly” is not wholly accurate. When my friend in Petoskey, Michigan sends me a letter, the APO part of my address means it will first be sent to New York City for the initial step of processing. At that point, the mail leaves the influence of US Postal, FEDEX, etc., so when sending something to a soldier, don’t waste your money on expedited service as they will only apply until it gets to NY. From NY, the mail is sent to Germany. Then to Kuwait. Then to Kandahar, Afghanistan. Then, finally, to Tarin Kowt. Each step of the way the mail can be subject to the whims of space on aircrafts being available, or the way the package or letter has been sorted and grouped with other mail. As my Platoon Sergeant puts it, it can be a crapshoot. We have received some mail in a matter of days while other items have taken over three weeks to arrive. But when the mail finally does arrive here at TK, nothing raises a soldier’s spirits more. So please keep it coming so that when the postman rings, there is something nice. You may have heard for every soldier on the ground and engaged in actual combat, there are at least 10 soldiers who are working in support positions to ensure the fighting soldier has everything from beans to bullets needed to accomplish the mission. This ratio is also somewhat applicable to soldiers who fly aircraft; for every pilot, you have mechanics, fuelers and other support team members who keep the birds maintained and ready. For example, in the 101st Airborne, where the borne is via helicopters, many of the 101st soldiers rarely get the opportunity to fly in our aircraft. Sometimes, such as in my case, the closest I get to the birds is to order, stock and supply the various parts needed by the mechanics to keep the aircraft flying. This, of course, doesn’t take into account the initial transportation involved during deployment; traveling to and from the base of operations. Getting to TK from Kandahar, I flew in a Chinook helicopter with about 20 other people, our respective gear, and “space available” mail; all jammed in and tightly strapped down. But, since there was no window and I was facing a wall of tied-down equipment (and a mail package in my lap), I might as well have been on a truck or a very loud subway. Today, however, the good people at our airfield offered soldiers a chance to experience the view from above with a great 20-minute flight on a Blackhawk helicopter. The flight was very smooth and we went in a large circle from the center of the valley, up to the bordering mountains, and back to our base. Think of the TK valley as a dinner plate with a Moon Pie touching the center and the left/top rim of the plate; the circumference of the Pie was the path of our flight. Each soldier got to sit right by an opening so we all had a really great view. There were no windows so I stuck my head out the opening like a dog in the family car; I had a big grin and the jet stream rippled my cheeks against my face. A couple of lucky soldiers got the opportunity to fire the 240; a 6.5 mm automatic machine gun. I was sitting with my back to the door gunner and didn’t know this was going to happen so when the firing started, I’ll admit I was wee bit startled. Oh, the weapon firing was done up against the mountains, no where near any populace. I forgot to ask the pilot how far up we were flying; it seemed to be around 300 meters, but that is purely an uneducated guess on my part. We certainly could see everything quite well and I was struck by the very clear river-irrigation demarcation lines. As you will note in the photos, where there is water, there is green and where there is no water, it is dry, dusty brown. For me, it was very interesting to get the view of the surrounding area; to put into perspective how there are many people living very close by me and to see the dramatic difference of the presence of water. It helped me get a feel for how the local populace's homes, their farms, and their lives, are just out of my everyday sight, but very visible and present when I got up in the air. On May 10, 1985, I turned 19 years old and enlisted in the Active Duty Army after serving in the Army Reserves for approximately the previous two and half years. One of the main reasons I went Active Duty was to go to Germany, where I lived for three years during the late '70s and attended middle school as a DoD dependent. I had fond memories of Germany and wanted to go back as an adult. 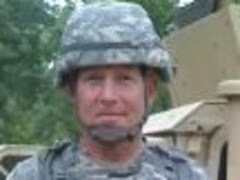 From Salt Lake City, Utah, I was sent to Fort Jackson, in South Carolina, where I was fully in-processed into the Active Army and then put on a plane to Frankfurt/Rhein Main, Germany. I was then sent to Heidelberg where I spent the next couple of years having a great time exploring Germany and Europe. One of the first things I did when I arrived in Heidelberg was attend the mandatory five-day "Headstart" program. The purpose of Headstart was to give soldiers a grounding in basic German language and the German culture. Soldiers were taught how to count to ten, say yes and no, thank you and please, and other common helpful phrases. We also learned many English words are derived directly from German; like gesheundheit means "healthiness" and kindergarten literally means "children garden". Since I had lived in Germany as a kid, I had a bit of a headstart (pun intended), on the other soldiers, but pretended I was a language prodigy in order to look good for the Frauleins in the class. Even though Headstart was a bit of a rehash for me, I still learned some new words and was able to get a good grounding of basic grammar and expand my Deutche vocabulary. So, when I found out I was definitely deploying to Afghanistan, one of the first things I wanted to know was if there was a Headstart program for Pashtu (or Pashto - depending on who you talk to). The short answer is "no", but I (and everyone else deploying) did receive quite a bit of language and background materials in various forms ranging from an inch and a half-thick book on Islamic culture to a CD consisting of a mini-Headstart with Pashtu numbers and phrases. I also received an "Afghanistan Culture Smart Card"; basically an 18"x12" laminated sheet that folds-up, a la road-map style, into a three by five inch packet that fits perfectly into my ACU breast-pocket - I have it with me at all times. Before we deployed, I did listen to the CDs and went over the smartcard, however here at TK, we really are not exposed to the locals very much (except for the bazaar on Sundays - I will tell you about that another time) so I haven't yet had the opportunity to see how terrible my pronunciation really is, but, if the occasion arises, I will be able to say gesundheit in Pashtu. 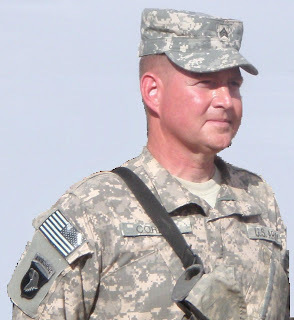 When soldiers join the Army, they are issued (given) Army Combat Uniforms (ACUs) with a US Army tab and another tab with their respective last name, which go above the front pockets of the ACUs. With very few exceptions, every other tab, insignia and patch the solider ever puts on their ACUs are not given, but earned, through honorable service and accomplishments. The Shoulder Sleeve Insignia Former War-Time Service patch, or "combat patch", is authorized to be worn (on the upper-right sleeve, centered under the American Flag patch) by soldiers who serve for a minimum of 30-days in a recognized combat zone. The combat patch is the unit patch of the unit a soldier is assigned to when deployed to the combat zone. Since the greater majority of soldiers did not have a combat patch in the early years of the on-going conflict(s), there was no real special fanfare when the patches were earned and they were distributed to soldiers toward the end of the deployment tour. As time progressed, and soldiers were going on their second, third, and even higher number of combat tours, the ratio shifted to a smaller majority of soldiers going on their first deployment and a ceremony to award the combat patch evolved – typically held about 30-days after soldiers have been in theater and the patch has been earned. The 1-101st Task Force No Mercy patch ceremony was held this past Thursday, the 29th. There were about 150 soldiers who received their first combat patch and 50 or so who received their first with the 101st – the Screaming Eagles. There was a palatable sense of muted excitement and anticipation by the soldiers who were about to be patched just as there was an air of bemusement of the soldiers standing to the side in an observation formation who had been there, done that, and got the patch. The battalion commander gave a, thankfully, brief speech (the ceremony was outdoors in direct searing sunlight and it was very hot) discussing the origins of the 101st and salubriously commenting on the division’s honorable history of service that is being carried on today by the soldiers at Tarin Kowt, Afghanistan. Although it may look like a smirk in the photo, I was actually trying to hold back the smile of deep satisfaction and pride at being a member of the 101st; and receiving the patch on my shoulder.